There are so many ideas for home decorating out there that the prospect of sifting through them and finding the style that is right for your spaces can be a little daunting. However in the end, all decorative endeavors come back to one thing, creating spaces that are lived in. This means that beauty is important, but even more important is that the beauty you create supports the function of the space. You want the decorative atmosphere of each room to support the utility of that space. The first thing you should understand about home decorating is that every space is made up of different physical and visual elements. These elements are arranged in various patterns, in order to create the atmosphere of the room. Some of these are inherent, built directly into the architecture, while others are mobile and transient, consisting of accents placed within a room by the decorative coordinator. The physical nature of the space is probably the most overt decorating element in any room. The way the walls are arranged, the way that doors and windows are set into these walls, and even the shape and nature of the ceiling, are all vital to the way that room is going to be used. These are also very difficult aspects to change, requiring advanced construction methods that can be extremely time consuming and costly. One idea for home decorating that will allow you to change the structure of a rather large space relatively easily, is the use of simple room dividers. These are pieces of cloth, trellis, or strings of beads that can be strung along the center of a room using either the floor and ceiling, or a free standing structure, as their base. The idea is to subdivide the larger room into smaller compartments, like well decorated cubicles, allowing one giant hall to take on many different divided aspects. The architecture of a room, and of the entire house, is intrinsically related to the nature of flow. That is, the way that people move into, out of, and through a space. Flow is important for keeping a room feeling free and active. When you clutter up a room too much, or block off doorways, windows, and other access points, you make a space feel claustrophobic and trapped, which can ruin the nature of the room entirely. Another basic element of decorating is color. The colors that fill a room are very powerful and subtle influences on the way we feel within that space. By understanding the nature of color, and how it impacts on a person’s psychology, you can create spaces which speak to the deeper nature of an individual. Ideas for home decorating that involve color usually require the use of coordinating tones. This can involve many different complimentary colors, alighting one upon another to create a single color based theme for the space. On the other hand, the use of contrasting tones can help to make a certain color “pop” out of the walls, giving it a dramatic impact on the nature of the space. In general, dark tones will tend to make a space feel smaller, with the walls closing in on you. This can be a good thing in an oversized space where everything feels distant and foreign from one another. The use of lighter colors has an opposite effect, causing walls to recede backwards, opening the space up and making it feel free and wide and empty. Illumination is another important home decorating element which can be used to great effect within a space. Many ideas about lighting décor involve the usage of multiple sources of light, some bright, some dim, in order to create a layered effect within the space. This allows you to take control of the way that light fills a room, letting you choose whether you want a dark and smoky atmosphere, or a bright and brilliant illuminated spectacle filled with energy. Sometimes a lack of light is just as important as its presence. When trying to create an intimate atmosphere, having only a dim glow allows you to cast sultry shadows on the wall, while the point of glow itself will simulate a campfire of warmth, around which people will tend to huddle seeking comfort. On the other hand, filling a room with illumination will tend to make it feel energized and active. This is especially true if you can use windows, skylight, and the sun itself to cast a glow throughout the room which is cheerful and excited. Here the use of colors will influence, and be influenced by the light, with darker colors soaking it up and thwarting the illuminated effects, and lighter, brighter, more vibrant tones creating an even greater sense of illuminated beauty. One great idea for home decorating is to draw the entire house together using a similar element or series of elements. This can be a picture, or a type of clock or wall hanging; it can be a certain pattern, or a color, or any consistent element which is used in every room in the house. This can be done in contrasting colors, or it can be consistent, it can be a theme such as nautical items, or rustic décor, but it can also be as simple as having art in the same style posted in each space. The idea is to create a sense of consistency in a subtle way that people will pick up on more subconsciously than overtly, as they move through the house. If you are having trouble finding inspiration, you can always look for ideas for home decorating in various home and garden magazines. There you will find pictures of the way that professionals design and arrange the rooms they create. You can then take elements from these designs, and apply them to your own home. Home decorating shows can also be a great source of ideas and inspirations. Often these shows will give you examples of how to implement small construction projects and crafting jobs in order to create beautiful elements within a room. You can even sometimes use these projects as springboards to your own creative concepts. Finally the world around you is an amazing source for ideas. Art and architecture, nature and plants, all have beauty within them that you can learn from. Becoming a truly great home decorator is about incorporating beauty from every aspect of existence into the flowing, living nature of the spaces that you are creating. Sandstone is a beautiful natural material that is formed over the course of thousands, or even millions of years. Buried in the heart of a mountain, this stone slowly emerges from the heady mix of chemicals present, each ingredient adding a subtle hint to the final appearance of the sandstone. The result is a one of a kind piece of the natural earth, with its own unique features, elements, and characteristics. In drink coasters, sandstone has become highly prized for its natural ability to absorb the moisture from a glass. This is because the material has very tiny pores in its surface. While these holes can’t be seen by the human eye, they are large enough to allow a liquid to soak into the body of the stone. When you take a piece of sandstone and wet it down, the water makes the stone seem to come alive, giving it a vibrant and glistening sheen which is usually reserved for polished materials. When liquid goes down into the material itself, it stays there, stuck within the stone, until it can evaporate away. In the case of sandstone beverage coasters, this means that even the sweatiest of glasses can drip and drab and still, there will be no mess, no hassle, and no problem. However, this functional feature of the stone does have its drawbacks. While sandstone will allow water to soak into its surface, it will also allow just about any other type of liquid to do so as well. In the case of fruit juices, sodas, or other colorful liquids, this can cause the substance to go down into the stone, staining it from the inside. Unfortunately such a stain is generally permanent. If a stain does occur on your sandstone coasters the best thing you can do is to thoroughly rinse the stone in warm water. Don’t use soap as this may actually stain the stone further. Rather you want to try to flood the material, using the warm water to melt the sticking juice, and hopefully slide it out of the piece. In the past sandstone was available in a wide variety of natural colors, however it was impossible to print a picture or a message on the face of the stone. Luckily today, new advancements in printing technology have allowed manufacturers to create a wide range of attractive coaster designs, printed with just about any image you can imagine. This gives you an almost endless possibility of choices when selecting a sandstone coaster set for your home or office. A coffee table can be a great way to add function to a room. It provides a place to set drinks, snacks, and other accessories, or to stretch out books, play board games, or look at a map. It is a wide open surface, just waiting for you to use it in any way that you please, and its very presence opens up a wide stream of possibilities in the room where it is placed. However there are a number of considerations you have to take into account when choosing a coffee table for a room. The first and foremost, is the function of the space you are choosing to use the piece in. What room is it? Most often a coffee table is used in a living room, or a den setting, where people tend to gather around in groups. Occasionally they can be used in a lounge, or library, as a place to set books when you’re not using them. Even rarer, you may find one in a bedroom setting where people can use them as a little extra storage for their day to day necessities. The important thing is to know and understand the nature of the space. Then choose a table accordingly. If it’s a social room, the table should be big enough to accommodate any guests or household members that will be using it. If it’s a private setting, then you can opt for something a little more intimate. The nature, size, and position of the table is what’s important. The next thing you have to consider is the size of the piece. Look at the room. Once you have chairs, shelves, and other fixtures in place, take stock of the floor space that is left. The table should not be a blockage in the room, but should instead be a conduit for more function. If you get a piece which is too big, it will kill the flow, making the environment seem stuffy and cluttered. However if you get a table that is too small for the space, the room will be oversized, and isolated. Nobody will be able to reach it, and the piece will be wasted on the space. Instead you should strive to find a table that is sized evenly for the room it’s being placed in. There should be at least 2-3 feet on every side of the piece, but it shouldn’t float listlessly out in the middle of nowhere. One thing to remember is that coffee tables are sized low. They are meant to be used by people sitting on couches, love seats, and recliners and they are not specifically eating tables. Instead they are designed to hold items temporarily, which are then used by the various people in the room. As such you should be sure to arrange your seating around these pieces in such a way that they will be accessible by all. Coffee tables can be a great accessory that can instantly multiply the function of a space. However you have to be careful about size and functional considerations. You want to ensure that the piece you choose actually enhances the environment, and doesn’t detract from it in any way. Our line of natural stone wall clocks is one of the most unique expressions in the home décor market right now. Consisting of over 20 different colors of natural stone, and each with a variety of adjustable customization options, there should be a clock available for just about any setting. Our clocks are crafted from a wide variety of natural stone materials. Some such as the Gold Blush wall clocks, or the African Multicolor clocks, are crafted from slate. Slate is a rustic stone that retains a lot of the essence of the mountain from which it was quarried. Other pieces are crafted from polished, imported natural marble. Clocks such as the Oak Wood Green or the Oak Wood Brown are the height of elegance and sophistication, with a wealth of dramatic colors hiding beneath the smooth polished elegance of the marble façade. One of the great things about these clocks is that each one is a little bit different from the last. In some stone types, two different clocks will be dramatically different, with two pieces having completely different faces. This means that the timepiece you receive will be entirely one of a kind, and unlike any other in the entire world. 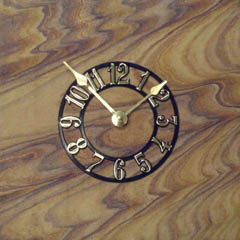 Each clock, as mentioned earlier, has a number of customizable options that allow you to make the piece even more unique. You have the option to choose from 4 different clock faces including 4 number burst, Roman numeral, Arabic numeral rings, or the highly popular natural face. You can also choose the alignment of the piece, setting it to hang either square, flushed against the wall, or in a diamond formation. The clocks all run on a simple AA battery, and hang from a steel loop which juts out of the back of the piece. This loop is highly durable and is rated to hold the weight of the stone indefinitely. Fossil Sandstone Beverage Coasters Are Back! 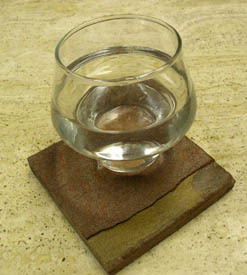 The fossil sandstone drink coasters were part of the original product line rolled out by PebbleArt back in 2004. Wildly popular, they quickly became our best selling item. However unfortunately, due to a problem with supply shipments from India, we were forced to discontinue this line for several years. Luckily we have just sealed a deal with a new quarry in Asia, and we are now able to get regular supplies of the beautiful and vivid fossil sandstone coasters for you once more. 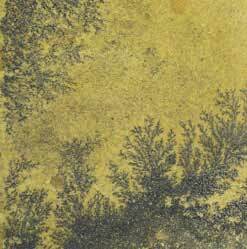 The fossil sandstone is different from the fossil marble coasters, in that the images which appear in its surface are much more dramatic. Generally the marble fossil stone features a wealth of very tiny, hard to identify fossil formations. These are often tiny leaves or shells, or small aquatic organisms. 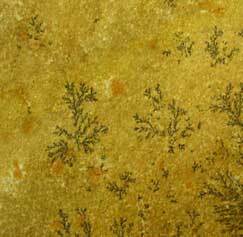 In the fossil sandstone, you will often see a huge, easily identifiable leaf, right in the surface of the stone. Sometimes you will get a large shell, or a piece of a larger plant. This is simply due to the nature of the mud and dirt that formed around these organisms, as well as the physical characteristics of the world around them over the years during which fossilization occurred. Another draw of these coasters is that they are formed from sandstone, which means that the material is highly absorbent. If you put a sweaty glass down on one of these coasters, the moisture will immediately seep into the pores in the stone, remaining there until it has a chance to evaporate away into the air. The problem with this is that if a colored liquid, such as a fruit juice, spills on the stone, it will enter the pores of the material, and can discolor it, permanently. If this does happen you should immediately wipe the liquid off, and then try to use warm water to extract any that may have already seeped into the stone. 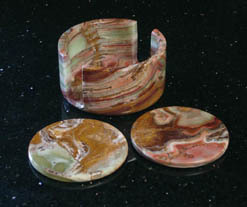 Another draw of these fossil sandstone coasters is that they can be paired up with two of our matched stone holders. They can be coupled with either the iron and stone coaster holder with a fossil stone medallion centerpiece, or a pure stone holder, which will be crafted entirely from the same material as the coaster itself. The fossil sandstone coasters are available on our site http://coasters.pebblez.com and can be purchased in sets of 4, 6, 8 or individually. A small kitchen table is an extremely useful device. Not only is it an extra surface area, that you can use to hold marinating dishes, or to set bowels on while you stir them, but it also has a social aspect. It is a way to draw friends and family together, to invite them into your culinary realm, for conversation and interactions. The kitchen tables we offer here at PebbleZ.com are all available in a wide variety of sizes and shapes. our smallest models are 24″ circles, and 24″X24″ squares. You should choose a square able when you have a spare corner to but the angle up against. This allows you to fill a corner without wasting any space, and cuts down on the amount of floor area taken up by the table setting. On the other hand, one of the 24″ round tables will actually take up less room than a square table, because it doesn’t have any corners sticking out into the floor space. If the table you want will be floating out in the middle ofa space, then a round table will actually save you a little room. It will also protect you from sharp jagged corners which can be rather painful if you arent watching where your going. If you have a slightly larger kitchen, you may want to consider increasing the table size. Some people even section off a portion of the kitchen to use as a breakfast nook or dining area. One effective way to do this is with a rectangular table, butted up against the wall. This can be used as an extra counter to work on, or as a buffet table, which easily allows your guests to help themselves. However if you want to make this a dining table floating in the kitchen, you can always pull it out, and set some seats against the wall side of the piece. Even if the table then encroaches on kitchen floor space, it is only temporary. 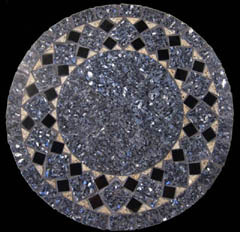 The tables we offer are available in over 40 different mosaic design patterns, with 12 different size and shape options. If you need something custom for your kitchen just let us know, we can usually design just about anything you might need. PebbleZ.com is known as the worlds largest retailer of natural stone home decor products. From humble beginnings, our product line has expanded to included hundreds of different items. these items are available in a variety of stone type including gemstone, marble, slate, and others. Each material has its own unique style, properties, and peculiarities, with each one having a distinct personality. In order to make shopping easier, we have created a page where we have sorted our line of home decor by stone type. This will allow you to see all of the different styles of material we have at a single glance, allowing you to more easily make a decision about which product line you would like to explore next. Our first collection consists of natural, polished marble home decor products. This is one of our most elegant and popular lines, and includes items such as marble vases, ash trays, shot glasses, chess sets, and coffee tables. Marble is a classic material that has been used in some of the great works of architecture and art throughout human history, and marble home decor is a way to capture some of that dignity, history, and elegance in your home, without having to pay for the expense of elaborate construction projects. Our next collection is made up of gemstone home decor products. These consist of a variety of products manufactured using amethyst, crystal quartz, and sodalite, as well as a large number of items built using semi precious agate. One of the great things about gemstone home decor is that the material itself is often quite unique, with erratic colors and shades forming in the surface, and with the shape of the item itself having unique properties. Usually these properties are left in tact, such as in amethyst, where the stone is naturally polished. 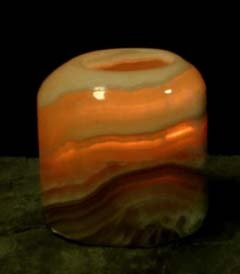 In other pieces, such as in most agate items, the stone is sliced smooth and then polished to perfection. Gemstone products on our site include beverage coasters, candle holders, and desk clocks. Alabaster home decor is one of our newest collections. It consists mostly of an exquisite line of chess sets, which are imported from Chiellini Italy. 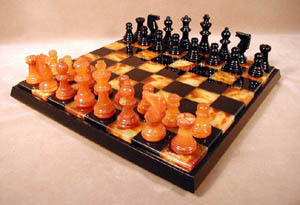 The smooth polished perfection of the alabaster, meshed with the unique and startling colors found naturally within the stone, serves to make these some of the most high end and exclusive chess sets in the world. Our last collection is the natural onyx stone home decor line. This material is very similar to marble, except that it has a translucent property, which allows light to permeate the surface of the stone to some extent. 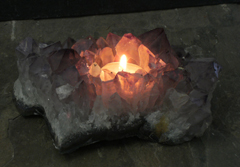 This allows us to create illuminated products such as the candle holder shown above. Even when not illuminated, onyx stone has a unique surface pattern, which consists of a variety of multicolored formations, occurring naturally, and erratically, throughout the surface of the piece. These features are different in every piece of stone, ensuring that every individual piece of onyx stone home decor is a one of a kind, unlike any other in the entire world. Our onyx stone collection consists of candle holders, chess boards, ash trays, shot glasses, vases, lamps, and many other unique items which can be found throughout our store. We are known as being one of the worlds first manufacturers and producers of naturally absorbent sandstone beverage coasters. We began as material importers, years ago, bringing container loads of exotic materials into this country from exotic locations around the world. These boat loads often contained crates of sandstone, an attractive stone, but with little to lend itself to decorative or functional purposes. However we noticed that when even a small amount of moisture was dropped on this material, it would disappear into the stone, leaving the sandstone looking darker in one spot, and discolored. Later on, that dark mark would dissipate, and all trace of the liquid would be gone. A little research and we discovered that the sandstone, which was being used in architectural and artistic applications, was actually made up of thousands of tiny pores, which were soaking the moisture into the stone, holding it, until it evaporated away. It didn’t take very much to get from that point, to understanding that this is the PERFECT material to use in functional and attractive drink coasters. We began by offering a line of just two of our more popular stones, shaved, cut, and refined down into sets of four beverage coasters. The original colors were Rainbow, an Indian sandstone, and Panther, another Indian sandstone. These were both very highly absorbent materials, and rather unique. They were an instant hit. Over the next year, we added several other highly absorbent sandstones to our line, as well as a variety of moderately absorbent slate coasters. As time evolved our company expanded, and in order to keep up with the public’s desire for new natural stone home decor products, we started to incorporate designs from other artists, manufacturers, and quarries. This included a line of domestic American sandstone coasters that we were really excited about. These coasters were round in shape, and honed to a smooth perfection that made them look very factory oriented. Next we found a manufacturer that had perfected a technique for printing directly onto the sandstone coasters, without clogging the pores. This opened our product line up to a whole host of new possibilities. Suddenly we were able to create coasters with thousands of different pictures printed right on the surface. Things were looking up for sandstone home accessories. 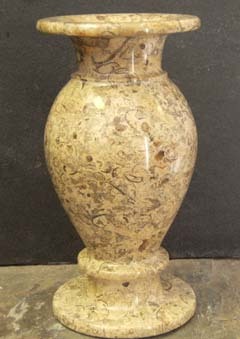 Our collection of fossil stone vases is one of the most unique and beautiful lines that we carry in our store. That is because each piece has a million tiny fossils, actually floating in the surface of the stone. These are dark imprints against a sandy backdrop, which speak up from the depths of history, telling a rousing story of struggle and life and the ancient world that gave us birth. These fossils were created naturally, and so the formations which occur in each and every piece are slightly different. They stand out because they are darker than the sandy beach backdrop, but that tone cane change from brown to red, to golden in hue. And of course, the patterns themselves can vary wildly, with shells, micro-organisms, leaves, and small plants all mixing and meshing in a unique geological and historical symphony which really tells the story of life itself. One of the great things about this unique feature is that the vase itself becomes a conversation piece in a room. It is unique, geologically intriguing, and a whisper from the past itself. Fossils are amazing, and owning a piece of fossilized stone in your home instantly adds to the interest of the space. These vases currently come in two different sizes. We have a larger 8″X4″ vase which is suitable for several flowers, and a smaller 8″X3″ vase which is designed for a single flower display. However they are both quite heavy, substantial pieces. They are made of a solid piece of natural marble, quarried directly from a mountain, and so they have some of that strength, weight and prominence naturally. The stone itself is polished smooth to a glimmering perfection. Tiny curves and sloping lines have been worked into the design itself, to give the piece and elegant complexion. Slate is one of the most beautiful natural materials in the world. It is a stone, which is quarried from mountain ranges in various locations around the earth. When it is extracted, it is taken from the earth in huge slabs, which contain a variety of unique colors and hues which form across the surface of the piece. This huge slab is then cut down into smaller and smaller pieces, and refined so that it can be used in architectural and decorative applications. polished: Not all slate can be polished, but those that can take on a shimmering, shining hue. 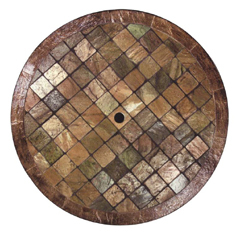 When used in a bistro table, the slate can be either clefted or honed. In the La Grande table, the slate used is called “Copper Stone” and it has been left with a slightly natural finish, which is bumpy… but still smooth enough to rest a glass on. By looking closely at the pictures you can also see that the stone has a bit of a shine to it. This comes from the sealant which is used to protect the stone. This chemical sealant seeps down into the stones pores, filling it with translucent liquid which then shines in the illumination of the sun. This table pattern can be crafted in a variety of square, round, oval, and rectangle sizes and shapes. We can also custom fit it to any size or shape that your particular space might need. Another customization that we can add to the table is an umbrella hole, placed in the center. This is especially useful because these tables are built for both indoor and outdoor use. One last customization is that the tables can be equipped with an illuminated onyx ring, which will loop around the outside of the stone of the table. This translucent loop of marble can be illuminated using a light switch under the piece.